That was a picture next to the paragraph about the Frank Hamer Jr. interview in the article I got the information from. I stand corrected, so I have no idea what the significance of that gun is. Rock and Glock, RETSUPT99 and OldChap like this. Watched this last night while the wife fell asleep in her recliner. She doesn't know what she missed out on. grouse, OD*, OldChap and 2 others like this. I fell asleep in MY recliner last night and woke up to a religious show. I will watch the entire movie today. I am a BIG fan of Woody. OldChap and Texas Red like this. My wife and I watched it last night. We thought it was great. I read up on the history and a lot of facts are still in dispute. So we don't know for sure exactly how it went down, but based on what I read, it seems the movie was a plausible reenactment, with some "Hollywood" thrown in. I thought the acting and the cinematography were great. The one gun thing I saw was it seems none of the handguns Hamer bought in the gun store got used. Instead both of the ex-Rangers in the movie used Colt SAAs, which I think was unrealistic given the better choices available at the time. Hamer was partial to the SAA in his early years, but later evolved to the S&W .44 Hand Ejector. However, in an 1992 interview, Hamer's son, Frank Hamer Jr, said that the handgun Hamer carrier on the Bonny and Clyde hunt was a Colt 1911 in the then pretty new .38 Super, shown below. OD*, OldChap, Old Man and 1 others like this. I didn't attend his funeral, but I sent a nice letter saying I approved of it. It was an OK movie but I wouldn't give it more than 4 stars. One of things I found interesting is when Hamer went into the gun store and bought how many firearms he wanted - no FFL, no NICS, no state permits, etc. Of course, this was before the NFA went into effect. Too bad people like Bonnie & Clyde ruined everything for the rest of us. OD*, OldChap and Old Man like this. Watched the movie, thanks for the heads up. Had Netflix for almost a year, first time I used it, actually first movie of the year. Nice cars, sure would like to get my hands on one of them 85 horsepower Ford's. I liked how they showed a picture of the real character and the name of the actor portraying them in the credits. Only two parts were a bit too Hollywood for me, the scene on the dirt field jousting with Bonnie and Clyde and they disappear in the dust. Pretty stupid. And the scene in the gun store where the guy asks Hammer "mind if I ask what you need all that firepower for?" Stolen right off the movie Charlie Varrick with Walter Matthow. Other wise, pretty entertaining, like watching movies about nice cars and nice guns. OD*, OldChap, Risasi and 1 others like this. The NFA went into effect a month after their deaths. Personally, I'm thinking the assassination attempt on FDR in 1933 had much more to do with its passage than did the likes of Bonnie and Clyde. The St. Valentine's Day Massacre, while often credited as the impetus, occurred five years before it became law. OD*, OldChap, Risasi and 2 others like this. I watched this yesterday, good movie. I have no idea about the historical accuracy, but didn't watch it for a documentary anyway. Interesting take on the buddy cop film. OldChap, OD* and Old Man like this. I did some searching for Hamer's .38 Super. I cannot find any trace of it anywhere. I checked the Ranger Museum and several other places Texas Ranger memorabilia is kept. If it existed, the family must have kept it. Only a few sources make the claim that when Hamer emptied the Model 8, he stepped out with pistol in hand. One of the reliable sources says he used the Monitor, while another claims the Model 8 that had been modified to accept larger magazines was his weapon of choice. 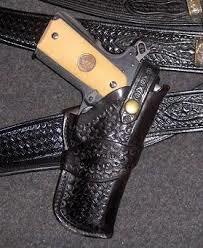 A few sources say he stepped out with "Old Lucky" (the Colt single action .45) in hand. I suspect the truth is that, having a Model 8 in 35 Remington and/or the Monitor with 20 rounds of 30.06 at hand, both easily capable of blowing through the steel doors of the Ford, Hamer probably was not worried about needing a pistol to penetrate the doors or any possible body armor. The subjects should have already been shot by the time it was down to handguns, and any handgun would only be a coup de grace through the blown out windows. Anyway, I suspect no one will ever know the truth of the events of that day by the posse. The participants just didn't speak much about it - even to their families. But, I love researching old events like this. Tstone, OD*, Old Man and 1 others like this. I recently finished Jeff Guinn's book on the killings. The Colt Monitor is the only gun he mentions Hamor firing, and then only after approaching the car once the initial barrage ended. According to what I've read, the assassination attempt on FDR involved a handgun. I wonder how that inspired the NFA and not the use of automatic firearms by Bonnie and Clyde or the St. Valentine's Day massacre. NECCdude, OldChap, OD* and 1 others like this. There were a lot of inaccuracies in this film, including several scenes that were completely fabricated...but I liked it anyway. "How's the view from up there Mr. Hoover? You high-flyin' sissy." In the magazine “Handguns for Sport and Defense”, March 1992 issue, Jim Wilson tells of an interview with Frank Hamer Jr. in which Mr. Hamer confirms that his father’s Colt was indeed a Super.38. Hamer was a gun-guy, no doubt in my mind he'd use a handgun known to penetrate those thick old car bodies. According other sources, the Super was the gun Hamer had in his hand when he stepped out of the bushes. Who knows. We do know, thanks to Zane Grey's writings, Hamer also carried a 1911 (which would have been a .45acp) in addition to Old Lucky as early as 1915. Tstone, OldChap and Old Man like this. I would like to know how he came to that conclusion when none of the witness, hell, even the participants, can't agree on anything. OldChap and Old Man like this.